In September the stock markets, via the S&P 500, did a whole lot of nothing. Since a large portion of my net worth is tied to the performance of the markets my net worth typically moves in line with the markets. Especially while we have no day job income. 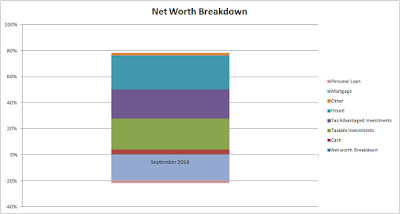 So flat markets mean very little change in my net worth. Although pulling in over $900 in dividends during the month helped to move things in a positive direction. Unfortunately, that wasn't enough. For the month our net worth decreased $7,715.14. Well this is a streak that we need to put an end to. September was the 3rd straight month of declines to our net worth. Considering that's come during a time of relatively flat market action something else must be going on. Honestly I'm surprised that we've only suffered 3 declines in our net worth since we've been without an income from a full-time job starting in May. For the month our net worth declined 1.61% although year to date it's climbed 14.09%. As of the end of September we have 23.9% equity in our house based on our purchase price from 2013. However, according to Zillow our house has increased just under $30k in value from our purchase price which is a nice bonus, although I keep the purchase price as the value in the net worth equations. Based on Zillow's estimate the equity in our house is 32.9% thanks to the appreciation. Truly passive income, dividends and interest, totaled to $893.82 during September which is over a $16 increase from June's total of $877.27. *Dividends are from my taxable accounts only. Adding in the gross income earned from blogging/writing added another $510.38 to the monthly non-day job income total. 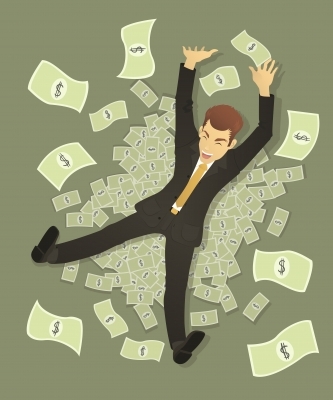 I'm pretty stoked to see over $500 from blogging/writing on top of the great dividend income. That's a total of $1,404.20 of income that's not related to a regular 9-5 job. We've still got a long ways to go to reach our goal of financial independence, but we're heading in the right direction. Year to date we've generated over $7.2k outside of traditional employment sources, dividends, interest and blogging/writing. 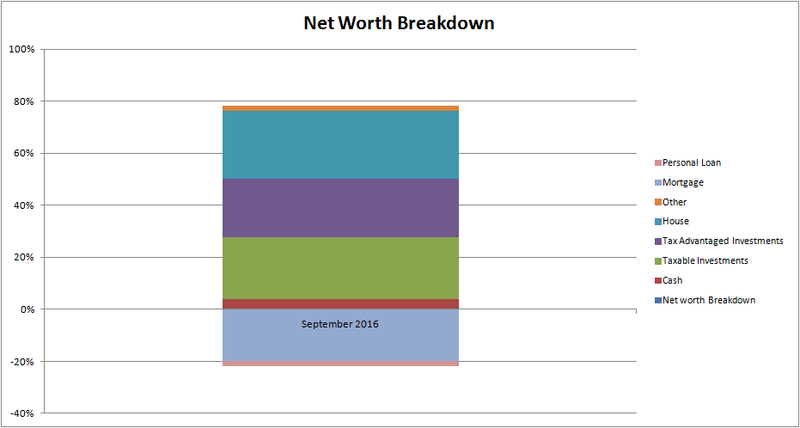 How did your net worth fare in September? Do you count any of the appreciation of your primary residence as an asset? Obviously my house is an asset, but I don't count it as an asset that is available to be used to finance retirement (though the fact that it is paid for enhances my retirement income). Reality is that I have to live somewhere and that if I stay in this area, chances are good that if this house increases in value, any other house I would want probably would too. Whether to include the house, at book value or "marked to market" or even include it, is one of the biggest debates. I choose to do so for my net worth calculations because the equity does represent an asset that can be tapped via selling the house if we need or choose to move.